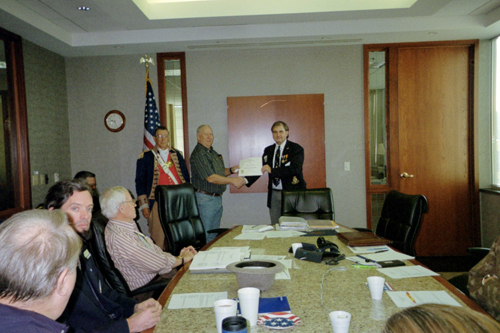 Pictured here with the Harry S. Truman Color Guard is Compatriot Dale Edwards, who received a Certificate of Appreciation at the 306th Harry S. Truman Chapter Meeting on December 11th, 2010. Compatriot Edwards received this certificate for his participation with the SAR Recruiting Booth at “The Wall That Heals” event in Blue Springs, MO on September 30–October 3, 2010. We appreciate his dedication in attending each day of this event. Congratulations Compatriot Edwards! (L-R) Major General Robert L. Grover, MOSSAR Color Guard Commander; Compatriot Dale Edwards; and President Dirk A. Stapleton.